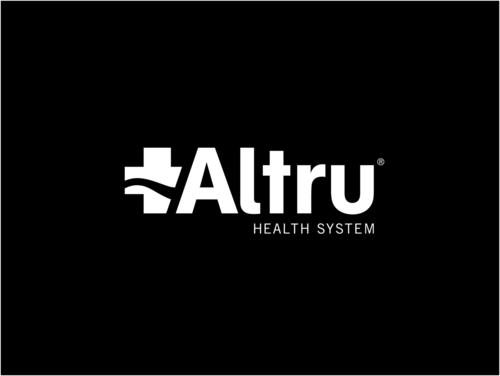 Write Into Action has learned from a confidential source that Altru Hospital has been under investigation for ‘pills’ since at least October of 2015. The source said she was present when an E/R doctor at Altru told her friend he could not prescribe her any mediation for pain management because Altru was “under investigation” for that. 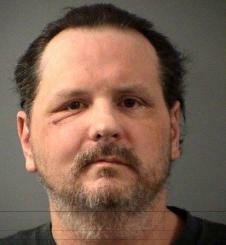 Altru is tied to the David James Elliott pursuit and shooting in several ways. According to the North Dakota Bureau of Criminal Investigation (BCI), “Thousands of prescription pills” were found in the vehicle of David Elliott after he was shot in the Altru parking lot following a police pursuit that began on February 27, 20105. Ironically, David Elliott’s troubles on February 27, 2015, appear to have begun at Altru. David Elliott, and his wife, Jennifer Elliott, visited Altru on the day of the pursuit/shooting. “On February 27, 2015, DAVID ELLIOTT had a doctor’s appointment at 7:50 a.m. At that time DAVID ELLIOTT was advised that his physician was no longer going to prescribe medications to DAVID ELLIOTT,” the BCI said. The BCI investigative records reveal David Elliott’s pick-up truck looked like a traveling pharmacy. However – David Elliott was never charged with any crime regarding the pills or drugs. Write Into Action is investigating a situation that involves ‘power of attorney’ papers that were in David Elliott’s vehicle at the time he was shot. BCI evidence inventory receipts reveal “Durable Power of Attorney” documents were found in David Elliott’s vehicle. 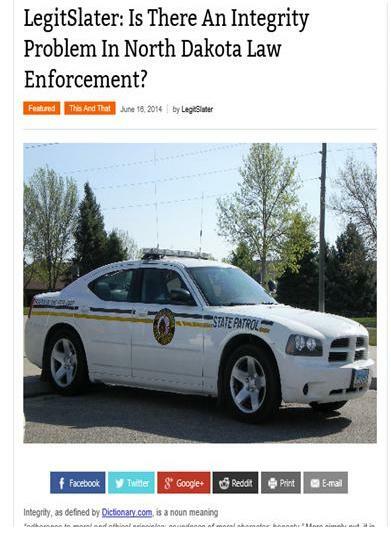 Records show the BCI executed a search warrant on David Elliott’s vehicle on March 4, 2015. During that search, BCI agents recorded finding prescription bottles and “thousands of pills”. However, NO entry is made on the evidence log for “Durable Power of Attorney Papers”. On March 10, 2015, BCI agents Michael J. Ness, and Scott Kraft met with Jennifer Elliott at the NDBCI office in Grand Forks. “Jennifer Elliott asked if she would be able to obtain the durable power of attorney paperwork that was in DAVID ELLIOTT’s vehicle. S/A Ness provided the durable power of attorney paperwork to Jennifer Elliott. (Please see copy of Evidence Inventory and Receipt, Attachment #2. ),” the report said. Records show a stand alone BCI inventory receipt was then created on March 10, 2015, that included only one item – “Durable Power of Attorney Paperwork” that was located in “Vehicle of David Elliott”. The stand alone receipt is dated March 10, 2015, but no ‘time’ is given. However, the receipts for prior search warrants contain a ‘time’. The paperwork was signed for by Jennifer Elliott at 10:54 A.M. on March 10, 2016. The original omission of the paperowrk found during a search warrant by the BCI is suspicious. Unless the BCI agent quick left the meeting with Jennifer Elliott; went and did another search of David Elliott’s vehicle; found the power of attorney paperwork; documented the search; returned and gave it to Jennifer Elliott; all in less than an hour; the evidence shows the BCI attempted to hide evidence in an official investigation of a police shooting. Write Into Action is investigating the relevance of the ‘Durable Power of Attorney’ paperwork that he and his wife apparently prepared, and how it may factor in to David Elliott’s alleged threats to committ suicide on the night in question, while simultaneously attempting to reach Altru Hospital (while the police formed a gauntlet to stop him). Write Into Action has discovered the following thus far. Write Into Action’s investigation continues. Official records prove North Dakota law enforcement spokesmen willfully deceived the public when they told the media the pursuit of David James Elliott began as the result of a ‘suspicious vehicle’ call placed at 10:41 P.M., February 27, 2015 from the Wells Fargo Bank in Grand Forks, North Dakota. It was a colossal deception at the highest levels. 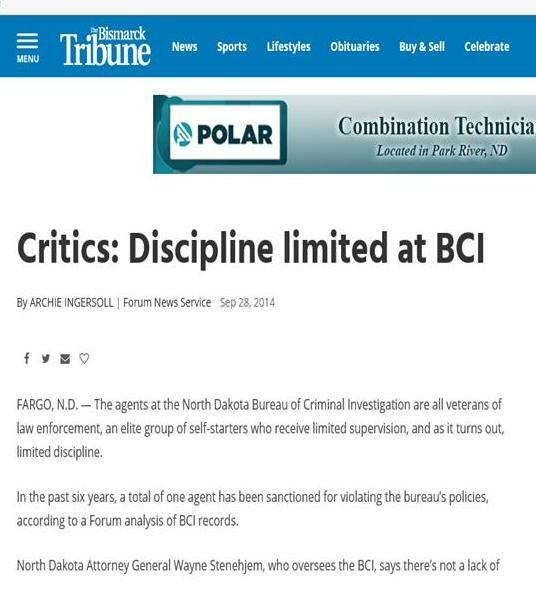 Write Into Action has acquired the investigative records of the North Dakota Bureau of Criminal Investigation (BCI) report, which says the complaint made from the Wells Fargo Bank was made between 11:30 P.M. and 11:40 P.M. that night. The ‘suspicious vehicle’ report has been the consistent starting line given by police to explain law enforcement’s focus on Elliott on the night in question before he was finally shot in the head in the Altru hospital parking lot at approximately 12:45 A.M., February 28, 2015 by a UND police officer. The whole story the police told was a lie. Law enforcement officials told the media that a call was made reporting a suspicious vehicle at 10:41 P.M., February 27, 2015, in the Wells Fargo parking lot. The deceptive communications by public information officers were so effective the mainstream media fell for the parlor trick. Police were called to the Wells Fargo Bank on South Columbia Road around 10:40 p.m. Friday for a suspicious black pickup. Someone from inside the bank reported the vehicle, thinking it was odd the pickup was in the bank parking lot at such late hours, said Grand Forks Police Lt. Dwight Love Wednesday. The reason law enforcement tricked the public regarding the Wells Fargo call was because police, state troopers, and deputies began chasing Elliot at approximately 10:30 P.M. but cannot EXPLAIN to the public WHY. SPOILER ALERT: It likely involves drug trafficking because according to BCI records Elliott possessed “thousands” of pills. 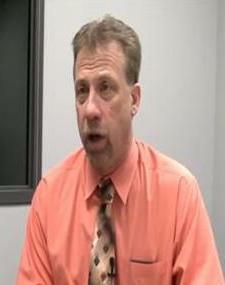 OFFICER WITNESSED DAVID ELLIOTT BEING CHASED AT 10:30 P.M. In regard to the first (1st) pursuit, Grand Forks Police Department Officer Chris Brown said that he was at the Altru Hospital Emergency Room with a female that refused to leave, and a pursuit began at about 10:30 p.m./10:35 p.m. Grand Forks Police Department Officer Chris Brown saw the first (1st) pursuit proceed northbound on South Columbia Road past the Altru Hospital, but he was not involved. Grand Forks Police Department Officer Chris Brown continued with his call at the Altru Hospital Emergency Room until around 11:00 p.m. Grand Forks Police Department Officer Chris Brown overheard Grand Forks Police Department Sergeant Mark Ellingson terminate the first (1st) pursuit. Grand Forks Police Department Officer Chris Brown said that he called into dispatch and heard that Grand Forks Police Department Officer Matthew Bullinger was on a 911 call with the suspect (DAVID ELLIOTT) in the pursuit, and that DAVID ELLIOTT had a domestic incident earlier in the day with his wife, Jennifer Elliott, and that he may be suicidal. DEPUTY ADMITS INVOLVEMENT IN PURSUIT THAT BEGAN AT 10:45 P.M. In regard to the first (1st) pursuit with DAVID ELLIOTT, Grand Forks Sheriff’s Department Sergeant Andy Schneider said he was west of Thompson, North Dakota, when it began. 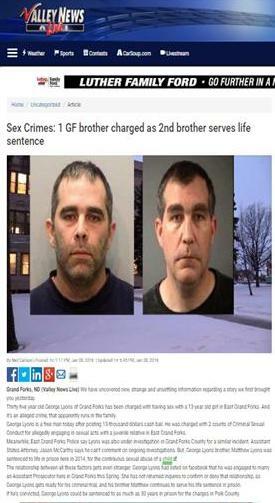 Grand Forks Sheriff’s Department Sergeant Andy Schneider believed that it occurred between 10:45 p.m., to 11:00 p.m., and he was heading towards the Grand Forks Air Force Base, Grand Forks, North Dakota, for dinner. Grand Forks Sheriff’s Department Sergeant Andy Schneider positioned his vehicle at a crossover about one (1) mile north of the Thompson, North Dakota, exit. Grand Forks Sheriff’s Department Sergeant Andy Schneider notified Grand Forks Police Department that he had deployed his spike strips. Grand Forks Sheriff’s Department Sergeant Andy Schneider indicated that Grand Forks Police Department Sergeant Mark Ellingson terminated the pursuit. 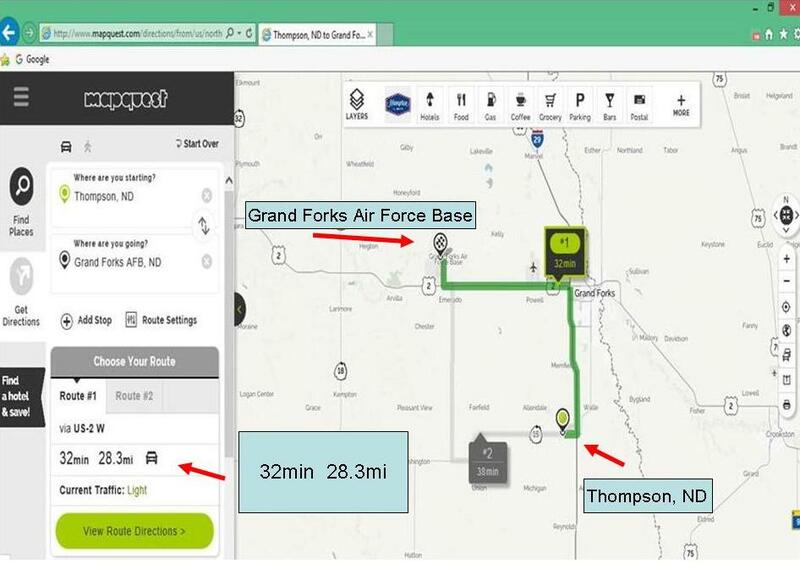 Now watch … after Deputy Schneider was busy laying out spike strips for David Elliott north of Thompson around 11:00 P.M, he is then magically transported to the Grand Forks Air Force base where he is eating dinner! Grand Forks Sheriff’s Department Deputy Nate Moen and Grand Forks Sheriff’s Department Sergeant Andy Schneider went to the Grand Forks Air Force Base in Grand Forks, North Dakota, at approximately 11:00 p.m., to have dinner. In the Affidavit filed with the court by the Grand Forks Sheriff’s Office, there is no mention of Deputy Schneider being north of Thompson setting out spike strips. 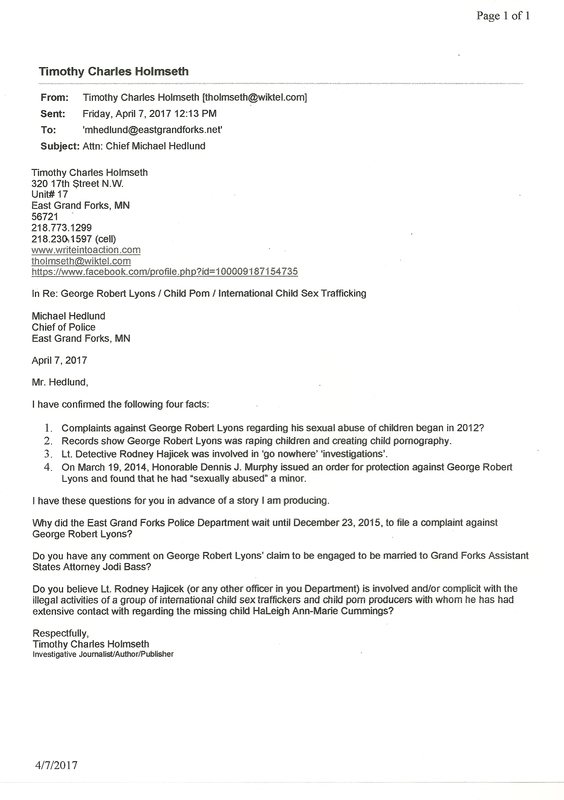 In fact – the GFSO does not mention setting out spike strips anywhere in their Affidavit whatsoever. The shooter, UND Police Officer Jared Braaten, was not scheduled to work on February 27, 2015 but suddenly did. He began his un-scheduled shift at 10:30 P.M. – the exact same time the secret pursuit of David Elliott began. Officer Braaten did not properly activate his dash-cam, and his body-cam did not work. UND Police Department officer JARED BRAATEN has been employed as a police officer by the UND Police Department for approximately one and one-half (1½) years. While he was not scheduled to work on Friday, February 27, 2015, to Saturday, February 28, 2015, he did work the days in question. UND Police Department officer JARED BRAATEN began his shift at approximately 10:30 p.m. 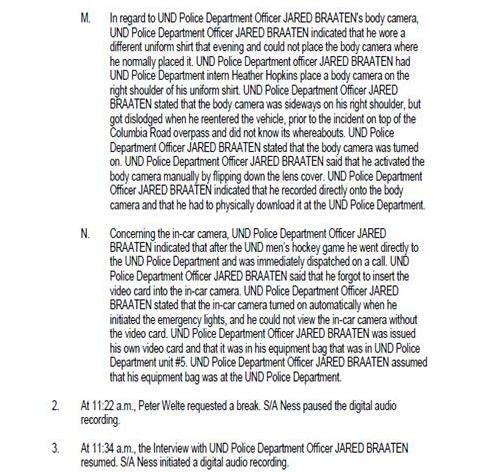 In regard to UND Police Department Officer JARED BRAATEN’s body camera, UND Police Department Officer JARED BRAATEN indicated that he wore a different uniform shirt that evening and could not place the body camera where he normally placed it. UND Police Department officer JARED BRAATEN had UND Police Department intern Heather Hopkins place a body camera on the right shoulder of his uniform shirt. UND Police Department Officer JARED BRAATEN stated that the body camera was sideways on his right shoulder, but got dislodged when he reentered the vehicle, prior to the incident on top of the Columbia Road overpass and did not know its whereabouts. UND Police Department Officer JARED BRAATEN stated that the body camera was turned on. UND Police Department Officer JARED BRAATEN said that he activated the body camera manually by flipping down the lens cover. UND Police Department Officer JARED BRAATEN indicated that he recorded directly onto the body camera and that he had to physically download it at the UND Police Department. Concerning the in-car camera, UND Police Department Officer JARED BRAATEN indicated that after the UND men’s hockey game he went directly to the UND Police Department and was immediately dispatched on a call. UND Police Department Officer JARED BRAATEN said that he forgot to insert the video card into the in-car camera. UND Police Department Officer JARED BRAATEN stated that the in-car camera turned on automatically when he initiated the emergency lights, and he could not view the in-car camera without the video card. UND Police Department Officer JARED BRAATEN was issued his own video card and that it was in his equipment bag that was in UND Police Department unit #5. UND Police Department Officer JARED BRAATEN assumed that his equipment bag was at the UND Police Department. At 1:07 p.m., Special Agent (S/A) Michael J. Ness requested that University of North Dakota (UND) Police Department Lieutenant Tracy Meidinger download the image from UND Police Department Officer JARED BRAATEN’s body camera. S/A Ness and UND Police Department Lieutenant Tracy Meidinger also looked at UND Police Department Officer JARED BRAATEN’s SanDisk four (4) gigabyte (GB) flash card, but there were no recordings pertinent to the officer involved shooting investigation. 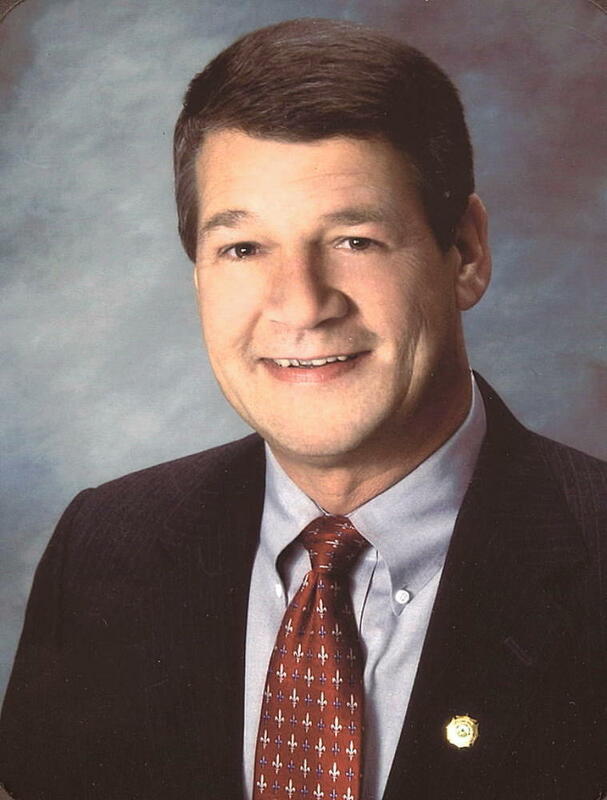 The BCI is an agency of the North Dakota Attorney General Wayne Stenehjem. Stenehjem is running for governor. 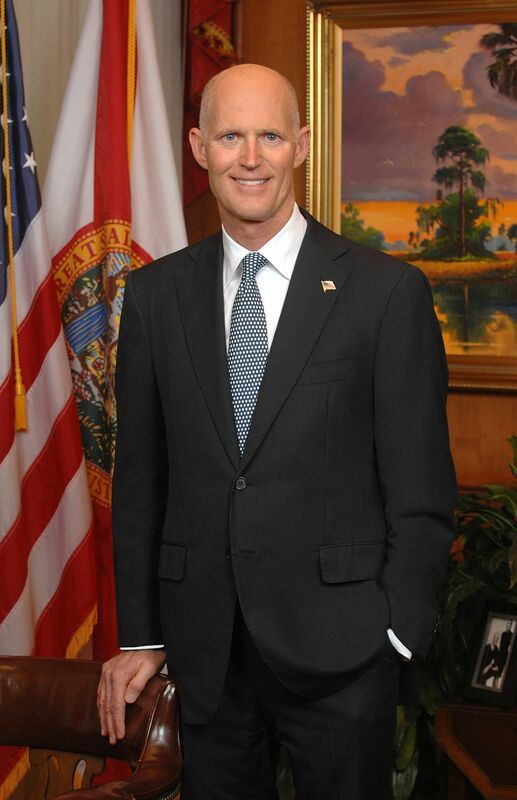 Fla. Gov. Rick Scott’s office telephoned investigative journalist Timothy Charles Holmseth today using a voice changer to disguise the voice of the caller. The caller said “stop it”. Holmseth previously received a hang-up call from the same number, which is from the Florida governor’s Citizen’s Services division. The telephone calls from Scott’s office come in the wake of Holmseth receiving a telephone call from the Trump Organization. Rick Scott’s Inspector General, Melinda Miguel, frequented a pill-mill in Tallahassee, Florida where she obtained prescription medication by fraud. Others close to Scott, including Attorney Heather Ross, also visited the pill-mill and committed fraud. Scott’s FDLE then tried to frame the doctor that exposed the drug trafficking scheme and forced the doctor’s child into hiding to escape a kidnapping plot. 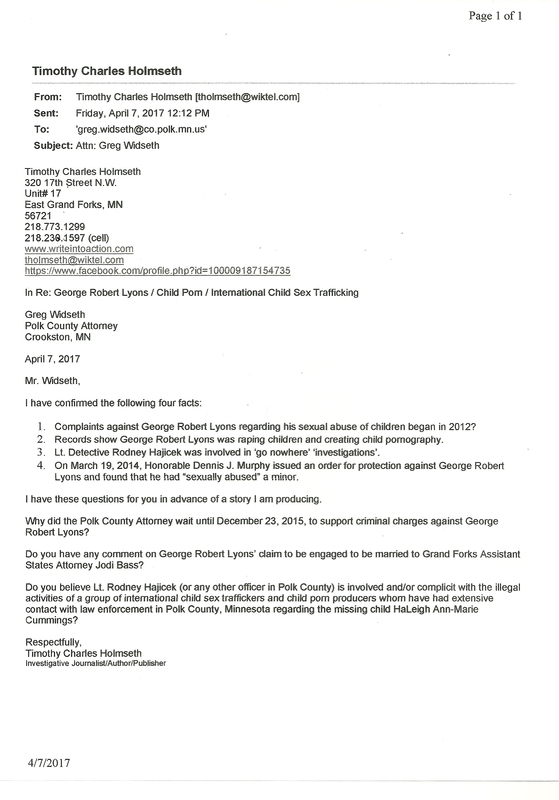 Holmseth has received numerous death threats from telephone numbers and emails out of the State of Florida, which were reported to the police departments in East Grand Forks, Minnesota and Grand Forks, North Dakota. Holmseth has been targeted by organized crime that created multiple videos demanding he remove all of his websites or else bad things will happen to him and his children.